Financial Post: Toronto unsold condos rising, but market strong. Urbanation said there were 3,841 new condominium apartments sold in fourth quarter of 2012, a 16% jump from the third quarter. The 17,997 units sold in 2012 was below the five-year sales average of 20,199. The 10-year average is 17,139. There is still a large amount of condo construction in the pipeline based on the fact there were 355 active developments in 2012 with 56,866 under construction. The average sale price in the fourth quarter was $536 per square foot in the census area, up 5.2% from a year ago. Unsold units were averaging $568 per square foot in the fourth quarter. Urbanation downplayed the idea that there is overbuilding in the Toronto market, citing a survey of builders. I don't know where to begin with this article as it is completely off and is simply misleading. Let's start with the title. First of all, the title should be renamed with the word "GTA" replacing "Toronto". All of the stats presented in the article are about Toronto CMA, which includes Georgina and Burlington. 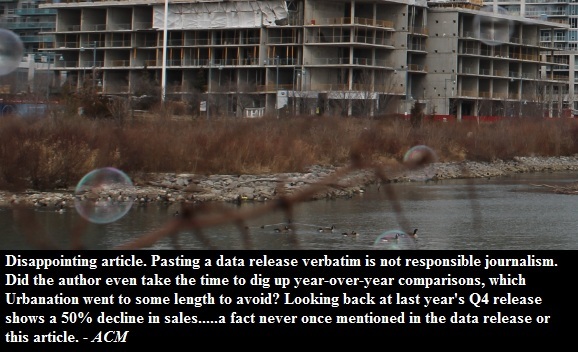 Look, no one is saying that there is a condo bubble in Georgina or Bolton, so please Garry, when you are talking about the Toronto Condo market, use relevant statistics. On top of that, I don't know how you can call a Toronto's condo market strong when the sales of new high rise units are down by 43% (2012 vs 2011) in City of Toronto and the mid January TREB report says that prices for condos in Toronto are down 4.4%. Secondly, Garry Marr, the author of the article, completely avoids a year to year comparison of the condos sold in Toronto CMA and instead compares 3rd and 4th quarters which is like comparing apples to oranges because of seasonal variation in sales. Urbanation has a slightly different data set than I have from BILDGTA, but they are still reasonably similar without about 6% discrepancy. According to BILDGTA, there was a 48% drop in sales of new high rise units in the City of Toronto. In sum, Garry, next time do your homework before calling Toronto's condo market strong!